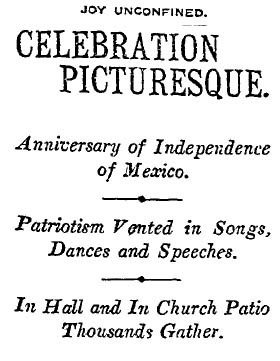 Mexican Independence Day was celebrated in a grand program sponsored by the Club Porfiro Diaz of Los Angeles at Turner Hall, 325 S. Main (demolished 1951), which was decorated with American and Mexican flags. This entry was posted in 1907, Music and tagged 1907, holidays, Mexican Independence Day. Bookmark the permalink.